Opening with an insolent, precise, tightly-wound bass and hats configuration, there's immediate affinity with Carl Craig's myriad shades of impeccable funk, A kinship is established between windy cities, gloom, lakeside living - a central if slightly murked connection. A primordial roving bassline wades through the cooled out density of 'Sonar Conversation', a body-speed electro-funked tussle follows on 'Robotic Arm Wrestle' : poised, oiled and housed with the swanked machine operative's last moments, chunnering his own bars to 'I can't stop this feeling' gently away to himself. 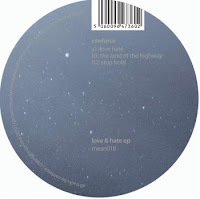 'Love Hate' already slayed us on twelve inch [MEAN018] and improves on every listen, mercy for its inclusion on this disc. 'First impression' typifies this album's marriage of fractured emotion with a heart of soulful belief - the pulsing but still functional human wreckage and embers that remain after the machines have moved on, if you like. 'Subtraction' doffs its cap to manchester's own emergent noughties sound: fat-sub-bassed, minimally-conjured, slightly-squeezed, acid-hi, tech-business. Superior stuff that wears it well on a drive at dawn through Babylon. 'Intimidation' certainly lives up to its title, a sullen sense of clammy fear and whispered malevolence emanates, while the tune builds up a significant dancefloor momentum, deadly funky even within its coldly insistent patterns. 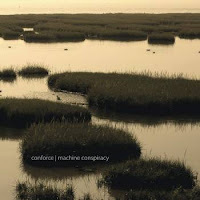 'Machine Conspiracy' warms us back to life with a thrumming Channel from a Basic surge and a rimshot to die for - one of those stripped dub destroyers you can return to in any mood for guidance - righteous music. 'Rare Education' jams on it like Magic Juan lording it at a mint bar hosted by Lil Louis, sheer classic vibes. 'Stop Hold' ushers us into a humid technological tropics where a brief history of the after-future is busy melting down all connections.